11/23/2006 I am User:Chochopk on Wikipedia, English as well as Chinese. I hereby allow all my images to be used on Wikipedia, including on Commons on 2 conditions. 1. The source must be mentioned. 2. Files uploaded must remain in their original file name, except for newer notes that have yet to receive a Pick number (i.e. the files that have "PNew" as part of their file names), where you can substitute "Newxx" with a known Pick number. I am also willing to discuss possibly better naming scheme. 12/04/2005 The domain name sinobanknote.com is about to expire. I'm thinking about switching over to sinobanknote.net, or simply renew sinobanknote.com. I cannot be sure what I will do ultimately. Also, I am aware that new banknotes are coming out, and this website is really lagging behind. I apologize for the delay. I've been very busy for the past 2 years. I'll try to catch up. 11/11/2003 Corrected the words "observe" and "reserve" to "obverse" and "reverse" (as in front and back). This correction applies to texts in the Wallpapers. 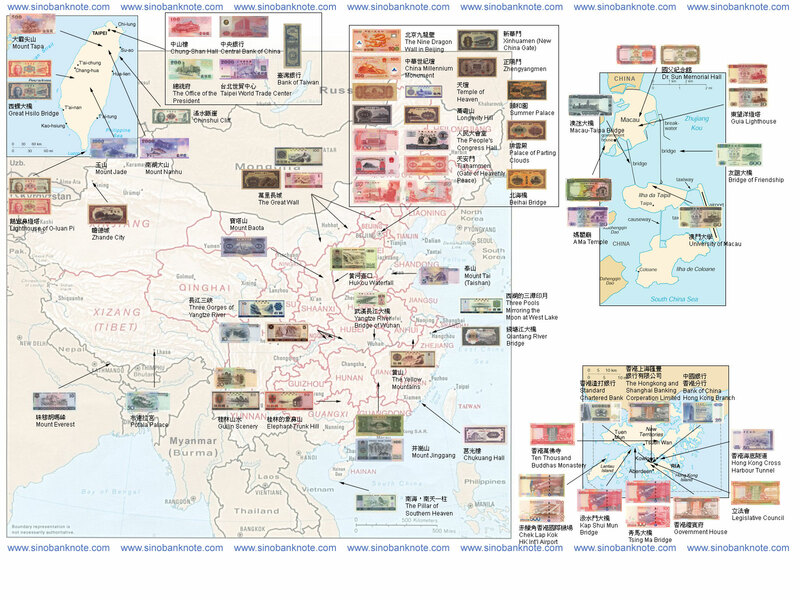 9/8/2003 Updated the banknote map and photo of HKD SCB 10 Dollars. 7/17/2003 Pick numbers updated: TWD P1992 200 Yuan, TWD P1993 500 Yuan, TWD P1994 1000 Yuan, TWD P1995 2000 Yuan, HKD HSBC 1000 Dollars, HKD SCB 1000 Dollars, HKD BoC 1000 Dollars, HKD Gov 10 Dollars. 7/3/2003 Sinobanknote strongly supports the issuance of TW 2000 Yuan, 200 Yuan banknote, and 20 Yuan coin. The main reason is to save government budget, to reduce the weight in people's pocket, and to increase the collectability of Taiwan Yuan. If you live in Taiwan and agree with me, please actively obtain those banknotes and coins from banks, use them and spread them to the public. Sinobanknote protests against the fact that Easy Card add value machines in Taipei Rapid Transit (subway) stations do not accept the 200 Yuan banknote. 3/8/2003 Some people have been hogging the bandwidth by sending redundant requests of currency exchange rates. The page is temporary down due to this exploitation. The Hong Kong Monetary Authority (HKMA) and the three note-issuing banks (Bank of China (Hong Kong) Limited, Standard Chartered Bank and The Hongkong and Shanghai Banking Corporation Limited) today (Wednesday) announced the forthcoming issue of a new series of Hong Kong banknotes in 2003 and 2004. 10 Dollar "Flower Crabs" Shortage. Larger Supply on the 20th. 7 Major Banks in Taiwan Accepting Cash Change in Feb.